Remember the good old days of recess? Getting bullied, withstanding pure chaos and melting on the concrete? Often thought of as a time of freedom and joy, recess far too often becomes the ground for reinforcing strife, exclusion, and instability. Oakland-based Playworks is rebuilding recess for maximum fun, nationwide, and teachers are noticing the difference. Thus far, Playworks is in schoolyards in 23 cities, serving 185,000 students, another 275,000 through training services, and teachers have reported that they have recovered 20 hours in teaching time due to smoother transitions– trust me, as a former teacher and youth-worker, transitions are critical. Playworks is teaching youth social emotional learning skills and leadership through organized games and reflection. LikeMinded has partnered with Playworks because of its visible impact in local,underprivileged, communities, as well at its broader capacity for transforming schools and learning spaces nationwide. 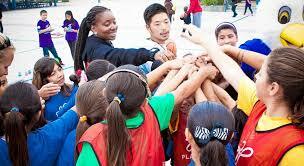 Not only does Playworks employ year-long coaches to lead games, it also trains youth and adults to be play leaders. Images copied from Copperview Elementary School:< copperview.canyonsdistrict.org> and Playworks: <playworks.org>. Sep 29th, 2015.